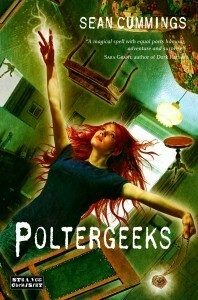 This week, we're giving away a copy of the paranormal YA book Poltergeeks. 15-year-old Julie Richardson is about to learn that being the daughter of a witch isn't all it's cracked up to be. When she and her best friend, Marcus, witness an elderly lady jettisoned out the front door of her home, it's pretty obvious to Julie there's a supernatural connection. This looks so good! And I love the title. Thanks for the giveaway! thank you for the giveaway!! enjoy your Sunday!!! Poltergeeks looks like such a fun book!! Thanks! I've been wanting to read this! :D Sounds so cool! Keep booking on!